This study replicates previously studied effects of task objectives and extends this work by examining people’s ability to predict the effects of task objectives on attention to visual stimuli. Twenty-eight participants watched a video in which six people were passing basketballs and a person in a gorilla suit walked through the scene. 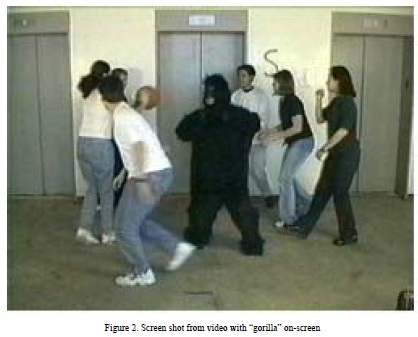 When participants simply had to watch the video (and not perform any secondary task while watching the video—“no-demand”), only one participant (3.6%) failed to notice the “gorilla.” Participants were then asked to predict the percentage of people that would notice the “gorilla” (a) under similar conditions (no-demand condition) and (b) under conditions where they were charged with counting the number of times that one of the balls was passed (demand condition). A second group of twenty-two participants then watched the video while performing the counting task and nine (40.1%) failed to notice the “gorilla.” Predictions from the first group were compared to actual noticing data from the second group. Prediction errors for noticing rates were substantially higher for the demand condition than the no-demand condition. Implications for accident investigation, post-accident safety interventions, and suggestions for general safety management are discussed.